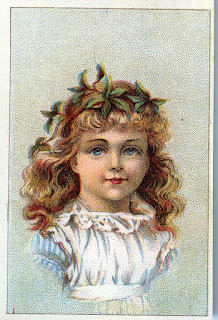 Victorian trading card (with a very boring advert for ovens on the back). Don't tell me: he's been sick everywhere? BAAAAD doggie! Yes, she's a sweetie alright. I like Victorian children - they always draw nice expressions for them. Very sweet rendering of the girl, I also like children from the Victorian era.. I wonder why they would use a young girl for an oven advert instead of a woman in apron or something..
Victorians were very sentimental re children, and probably thought it was super-cute. This young lady is wearing a pinafore, which is like an overdress, to protect the outfit underneath. Poorer families would change the pinafore often, not the dress, to cut down wash & wear. Rich families would dress the children in very lacy pinafores to show status (handmade guipure lace etc).